Geriatric dentistry, or geriodontics, is on the rise across Canada as the average age of Canada’s population rises and shifts to specialized care facilities. The Baby Boomers are aging, and a great many of these folks have mobility issues. While society has done great things by creating affordable self propelled wheelchairs, and other scooter-like contrivances, very few dental clinics in Canada are properly equipped to lift wheelchair bound patients up into reclining dentist chairs. This leaves the practitioner with two choices, either they can choose to work on the patient in their wheelchair, or unfortunately decide that they are unable to treat the patient. Wheelchair Lifts Make Dentistry More Accessible To Seniors. 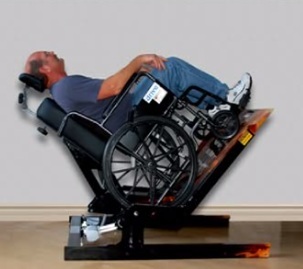 Versatilt allows the dentists and other medical practitioners to recline the patient in their own wheelchair. The operator can tilt the subject up to 65 degrees, and the Versatilt unit will support up to 750 pounds. The Diaco dental chair is a fully mobile dental platform designed specifically for wheelchair patients and that can support heavier loads. They have a large market share in Europe and Asia but are not as common in North American dentistry clinics. Not moving the dental patient from his or her wheelchair to the dental chair completely eliminates the risk of injury (both to the dentist and to the patient) due to such vertical transport, however the convenience may be short lived for the dentist then has to reposition lights and other special equipment to facilitate surgery, or even just a routine checkup. VersaTran USA makes the most versatile personal transportation unit yet created for the dentist office. The chair can be automatically shifted into almost any position and features a built in commode. Hoyer Advance-H is a hydraulic lift with a unique swan neck leg design to easily accommodate all models of wheelchair bound patients. The unit features an over sized handle which offers increased control and the push foot-pad reduces the force needed to initiate movement. No special tools required to fold the rig, which collapses down into a more compact storage position. This item retails for about $1400 USD. Some of the more sophisticated Canadian dentists have installed wheelchair lifts right into the ceilings of their operatories. 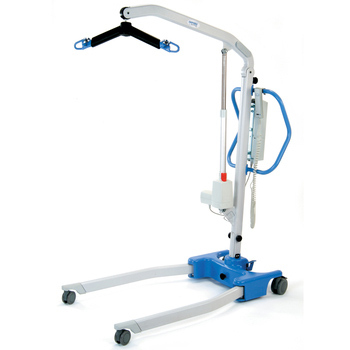 These overhead devices have the advantage of being easily concealed and if designed properly can offer a much wider range of movement between surgical stations, bathtubs, massage tables and of course wheelchairs and scooters. Dr. Natalie Archer at the Runnymede Dental Center is a hospital dentist in Toronto that uses overhead Hoyer lifts to make her dentistry more accessible to elderly and patients with mobility issues. Dr. Natalie Archer, DDS, has ceiling mounted body lift devices to make it easy for wheelchair-bound patients to get in / out of their seats, and up and into the dentist chair. The dentist simply has to slide the blue polystyrene sling under the patient and then attach the sheet at four points to a yoke which makes a cradle. The patient is then easily and comfortably lifted up, out of the wheelchair, and onto the elevated dentists’ chair. In this example the entire mechanism then hides away, back up in the ceiling so the rig doesn’t require any additional space. In recent years, much attention has been paid to the physical, attitudinal and financial barriers that people with special needs face when trying to access the medical care they need. Canada’s aging population needs access to modern dentistry to maintain quality of life as they advance in years. Poor oral health is considered a risk factor for many other health conditions. Older adults are more susceptible to dental maladies due to an increase in chronic conditions and restricted mobility. Yet science shows that keeping your teeth clean and gums healthy and disease free is an integral part of overall health and wellness. I agree; a hoyer lift would be a viable tool to use for the safety of patients.